We all don't get to practice as much as we like due to time constraints. But sometimes just playing smarter and making better decisions on the course will help you more than you realize. Tee your ball up on the same side as the 'trouble' on the hole. Trouble means OB, lots of sand, water, etc. Now you will be aiming away from the bad stuff, instead of towards it‎. Take a few practice swings so you get a feel of the club brushing the turf and taking a small divot. Swing through to your target so the ball has the best chance of going where you want! The priority should always be to get out of the sand first, then worry about being on the green or close to the hole. Remember: with a long distance shot, you will want to hit the ball before the club hits sand. On greenside shots, you will want to hit the sand‎ and NEVER touch the ball! While getting the ball in the hole is the goal on every putt, a more realistic goal is to make sure you are stress free on your second putt. Take the time to line up properly and follow through to your target. Exhale before you swing so that your muscles are relaxed. Also, when you find trouble (we all do)‎, don't be a hero and try a miracle shot. The definite way to high scores is to follow a mistake with another mistake! All of us at KSR are extremely pleased to let you know that Assistant Golf Professional, Paul Wilks has returned for his third season at Kokanee Springs. Paul is tremendously excited to be back for another great year, and looks forward to welcoming and serving you all during our 50th Anniversary Season. Paul was born and raised in Woodstock Ontario, where at a very young age, he developed a lifelong connection with the game of golf. "It was a place of peace and comfort for me", Paul says. "After purchasing a golf membership with a little help from his parents, he would spend most of his summer days consumed by his passion for, and committment to the game." As a graduate of Fanshawe College's Golf and Club Management program, Paul has worked tirelessly to expand his knowledge of the game and the golf business, proving to be a invaluable asset to the KSR team. His move west to British Columbia a few years ago came as an easy transition, as he quickly fell in love with the colossal mountain ranges and incredible landscapes of the Kootenay region. 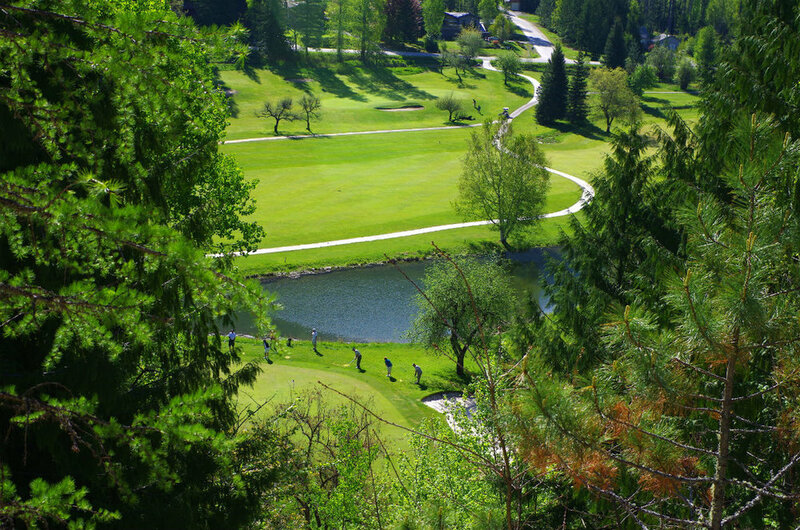 "Thank you Kokanee Springs - it is a privilege to work at such an outstanding golf course. I could not be happier. 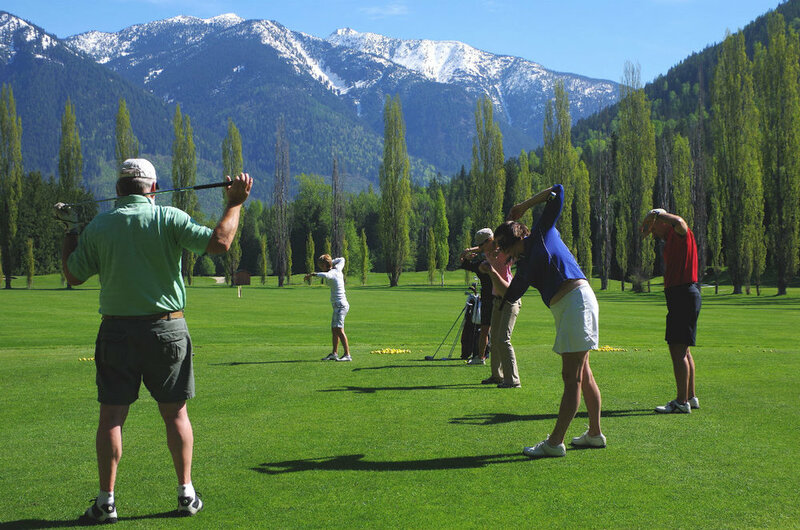 The beauty, aesthetics of the course and resort, along with the rich history Kokanee Springs has to offer, makes this a very special place to be." Having qualified with the Canadian Professional Golfer's Association, Paul's passion has turned in to teaching the game, to any level player. His hope is to show you HIS passion through the improvements of YOUR game. Now that spring has sprung and golf courses are set to open, many golfers will have visions in their head of how much better they will play this season. We have touched on various equipment topics in past articles this winter. Technology certainly has come a long way and advances in golf ball and club design have made it easier to ‘buy a game’. However, there is no substitute for golf lessons. It will do you no good to buy a brand new set of clubs if your swing changes radically from day to day. Thus, it makes sense to take lessons or practice occasionally to develop a consistent swing (this doesn’t necessarily mean you are a good golfer, just that you have a solid foundation to work from). After that, properly custom fit equipment can augment your game and send you down the road to improvement. Taking golf lessons can be an awkward experience. You will certainly be exposed with no place to hide on the practice range. But please be aware that your local PGA of Canada professional has seen many beginners and other golfers needing a tuneup. The path to improvement starts with having a trained set of experienced eyes guiding you to make adjustments and set up a practice routine. Please do your instructor a favor when you show up to your appointment. Warm up just prior to the lesson so that you are in the groove and have a consistent motion engrained. Then you can get to the heart of the lesson and make the most of your time together. Believe me when I say that one of the most frustrating parts of giving a lesson is when your student is using a ‘fake’ swing. What I mean is that sometimes a student will change their swing to what they think is more aesthetically pleasing to the instructor. This defeats the purpose of getting instruction! Use your authentic swing (as ugly or bad as you may think it is!) so that your instructor can readily identify the major points to focus on. Finally, to get the most out of your lesson, please practice what you worked on! Remember that a lesson is a partnership. The instructor has a duty to impart wisdom and knowledge to the student, and the student has a duty to practice what is being taught so that progress is being made. When an instructor has a student that doesn’t do their part and make an effort to improve, it makes subsequent lessons less effective since a lot of time is wasted in just ‘catching up’ from the prior lesson. This doesn’t do the instructor or student any good! I wish you well on your quest to make 2018 your best golf year yet! Here are some tips that will improve your yardage off the tee that will easily work for anyone. 1. Widen your stance. At a minimum, your feet should be shoulder width apart. But try making your stance even wider and you'll find that you will pick up some more yardage. The reason for this is your swing arc will be wider (generating more swing speed) and you will hit the ball with a more sweeping motion rather than a descending one. The result is the ball will be hit with more force (without more effort) and the trajectory will allow for more roll when the ball hits the ground. 2. Tee your ball up higher. As a general rule, when your driver head is sitting on the ground, at least half of your ball teed up should be above the top edge of the driver head. This might look strange and give you the sense that you will go right underneath the ball and pop it straight up in the air. But realize that your driver head comes through the ball off the ground, not along the ground. What this encourages is that the ball is hit on the center of the clubface and not the bottom of the clubface, which transfers energy better (more distance) and avoids the ball being launched too low. 3. Turn your shoulders. ‎By using the larger, more powerful muscles of your body, more force is generated without the need to swing harder or faster. Focus on turning your lead shoulder under your chin on the backswing and then have your trailing shoulder under your chin on the follow through. Don't worry if you don't have the flexibility to quite pull this off, or if you feel your arms aren't swinging back far enough - the goal is to have the feeling that your upper body is rotating versus your arms only swinging. As you get more used‎ to this motion, your arms will naturally follow where your shoulders lead them. As we continue to look at the makeup of your toolbox, let’s focus on what wedges we can add to your set. This will make your game simpler and ensure that you have specialized tools for the short game, which is an area where many shots are wasted due to poor execution and planning. A good starting point for this is to determine the loft of your shortest club in your bag (likely your pitching wedge or gap wedge). This club will look the same as the rest of the irons in your bag and generally should be the last club which you consistently take full swings with. You can find this information stamped on the club somewhere, or by searching for the club specifications online. Let’s assume that this is a gap wedge (usually stamped G, A, U) and has 50 degrees of loft and when you swing with it fully you hit it 120 yards. You may recall in an earlier column that there is usually 4 degrees of loft separating the irons in your set which equates to about 12 yards in distance. This allows for proper distance spacing. If the lofts are too close together than you will have two clubs that hit the ball basically the same distance so you are wasting the chance to have a better tool for your game. If the lofts are too far apart you will have a large distance gap in your set where you will now have to swing very hard with the shorter club, or really ease off on the longer club. Unless you practice frequently, you likely wont have the touch and feel to pull these shots off in a real-time situation. Therefore, it’s best to aim to have 4 degrees difference in your clubs and thus you can take the same consistent swing with the proper club as the yardage dictates. Based on the above example of your gap wedge being 50 degrees, perhaps selecting a 54 degree wedge and a 58 degree wedge would make the most sense based on yardage. You would probably hit the 54 degree wedge about 108 yards, and the 58 degree wedge about 96 yards. It will be up to you to evealuate your game and decide which distances you usually encounter when you play and select the loft requirement that fits this perfectly so you can not worry about swinging harder or softer than you normally do. Perhaps this means that you would choose a 55 degree and 60 degree arrangement instead which would now give you about 105 yards and 90 yards respectively. The next main consideration for wedges is the bounce. You will find this info stamped on the wedges. Bounce is the angle inscribed by the leading edge of the wedge, the sole of the club, and the ground. In practical terms, lower bounce wedges (4 to 8 degrees) are advised for thin grass and tight lies, whereas those with more bounce (10 degrees and higher) are generally employed in deep rough or sand. Choose your bounce based on how much trouble you have in the sand, or where you use your wedges the most. Some players prefer to have mid levels of bounce (8 to 10 degrees in both) for versatility purposes, while others select a high bounce wedge (as a ‘sand’ club) and a low bounce wedge (for easier ‘loft/lob’ shots around the green). If you have too much bounce on your wedge, you will skull (low driving shot) your shots as the club literally bounces off the ground and the leading edge of your wedge hits the ball, instead of the grooved face popping the ball into the air. Too little bounce may lead to the club digging into the ground and you will hit a lot of fat shots. Therefore, it makes sense to dedicate some time using different bounces until you find what best suits your game. Our focus on the improvement of your game continues as we move away from the putting green and now look at another important factor in golf, the short game. Essentially, the short game is all facets of the game that do not require a full swing of the golf club. This includes chipping and greenside bunkers, as well as pitches (half or three quarter swing shots) within 100 yards of the green. Before we go too far down that road though, let’s look at the overall state of your tool box (your golf clubs) and see what a general plan of attack is. Visualize a typical round of golf for you at the course you play the most during a season. As you move through the holes and shots in your mind, tally up how many times you hit each club. Remember that you may have up to 14 clubs in your bag. Now that you have tallied up the times you hit each club in your round, look at your results. There will probably be a few clubs that you hit many times, and some clubs that you might not hit at all. There may also be some times where you find yourself hitting some of your shorter clubs with half or three quarter swings because you don’t have a club that ‘fits’ that distance. My advice on the make up of your set is this. Your driver or three wood (main club used to tee off) is essential. So is your putter. Fill in the majority of the rest of your set with irons. At the top end (longer clubs), which is the club that you can use most confidently? For most people, this is probably a five iron. You may notice that irons sets rarely have the very difficult to hit three-iron and four-iron anymore. These have been replaced by the easier to hit and more versatile hybrid club. At the lower end of the set (shorter clubs), which is the shortest club that you still need to swing fully in order to reach a certain yardage? For example, do you swing your pitching wedge fully on every shot or do you use a full swing 70% of the time and use half swings the other 30%? You may have noticed that most iron sets now come with a gap wedge (stamped with the letter A, G, U or another letter) and a sand wedge that look the same as the other irons in the set, only shorter. This is for several reasons. First, lofts on irons have strengthened, mostly due to equipment manufacturers having the desire to market that their clubs go further than their competitors. This means that what may have been a five-iron 15 years ago is now stamped as a six-iron. This of course makes the three-irons and four-irons even less lofted and even more difficult to hit. As an extension, that’s why in a typical eight-piece iron set these days, there may be hybrid clubs (easier to hit) in place of the long irons, and sometime included are the gap wedge and sand wedge which are essentially the nine-iron and pitching wedge from yesteryear! With all that being said, you may now have a ‘core set’ as follows: driver, five-iron to pitching wedge (6 clubs), gap wedge, putter. That’s nine clubs, leaving potentially five more to add to your set. Most likely, you will need at least two clubs at the top of the set to use for second shots on par fives, and tee shots on the shorter par fours and long par threes. We can look at the makeup of these longer clubs in a future column. On the bottom end of your set, you will likely need at least two more wedges to add to help you with scoring. You’ll likely find that these clubs will be used frequently in your round, right behind your driver (or main club you use to tee off) and your putter. You may think that you don’t need all these wedges. But perhaps it helps to remember that although these clubs are stamped as ‘pitching wedge’ and ‘gap wedge’, as stated before, there lofts and characteristics are essentially a nine-iron and pitching wedge. Essentially, worry more about what these clubs do, as opposed to what they look like. In our next column, we will tackle the important factors in selecting what these two wedge additions will need to be in order to give you the most bang for your buck and help lower your scores! Now that we have the putter clubhead style that suits your putting stoke as well as it adjusted to a more appropriate length, we can now look at some of the fundamentals of putting that you can practice to help you improve your scores this season. You may have also noticed that there are also larger grips on putters these days. A larger (thicker) grip will minimize the amount of hand action in your putting stroke which reduces the chance of the club being twisted during the stroke and thus sending the ball offline. Golfers who are a bit twitchy with their nerves, or have some arthritis or other hand pain, will benefit from these larger grips. However, if the grip is too large, you will have less ‘feel’ and may find it more difficult to gauge the distance of your putts as the putter will be begin to feel unwieldy. Experiment with different grip sizes to find one you are most comfortable with. Commitment – now that you have the aiming point decided and confirmed, all you need to do is put the ball in the hole. Remember, the ball does not have a mind of its own and will only do what your putterhead commands! Always take a few practice strokes to program your brain into the length of putting stroke required to achieve your goal. A good drill to practice is to stand with a ball in your hand and underhand throw a ball to the hole. Note how far your arm swings back and through. This will give you a sense into how far back and through you should swing your putter. Remember that the putting motion is a gentle stroking motion, not a violent hitting motion. You’ve taken the time to aim your putt properly and now have taken a few practice strokes to gauge the feel. Now all you have to do is COMMIT to the putt. What this means is to replicate you practice strokes as best you can and please FOLLOW THROUGH (your putter head should swing through the ball and not just stop at the point of contact) - this is the only way to guarantee that your putterhead will propel the ball toward the intended target. All of your preparation is wasted if you do not commit to your goal and give the ball its command to GO IN THE HOLE! Remember that not even the best golf professionals make every putt, all you can do is prepare properly and commit to the best of your ability. Once the ball leaves the ball leaves your putterface everything is out of your hands, but if you do your best on every putt your putting will certainly improve! Often referred to as the “Flagship Golf Course of the Kootenays”, Kokanee Springs Resort opened in 1968, and now a half-century later, we’re extremely proud to be celebrating our 50th Anniversary Season! In doing so, we’d like to share some of our storied past with you. Below is small excerpt from “Remember When: Celebrating 100 Years of Crawford Bay on Kootenay Lake, British Columbia”. This book was put together by Susan Hulland and Terry Turner, who are still residents of the area to this day. This fantastic publication is available at the Gray Creek Store; we encourage you to pick up a copy and enjoy the rich history and stories of our magical home. “First part of the multi-million dollar shot in the arm is an 18- hole golf course. And it is the machinery creating it which has changed the shape of this peaceful area. Machinery estimated at nearly one million dollars-worth has been working in the dust of construction. The colossal job of earthmoving is undertaken by Cranbrook Construction and Dominion Landscaping of Vancouver is directing where the earth should be moved to and from. Golf Course architects are Norman H. Woods and Associates. Join us in celebration of our 50th Anniversary Season, with legendary golf, epic adventures and unforgettable experiences. Kokanee Springs Resort – British Columbia’s Legend. Picture yourself standing on the center of a giant clockface and move your putter back and forth as you would when putting. Does it feel like the putterhead flows in a straight line from the 3 to 9 consistently, or swings more in an arc from the 4 to 8? Neither way is wrong, but very important to deciding the right tool for the job! If you have a straight line stroke (from the 3 to 9) then you should look for a mallet style putter. These have most of the weight in the face to keep the putter square throughout the stroke and naturally aid this type of stroke. 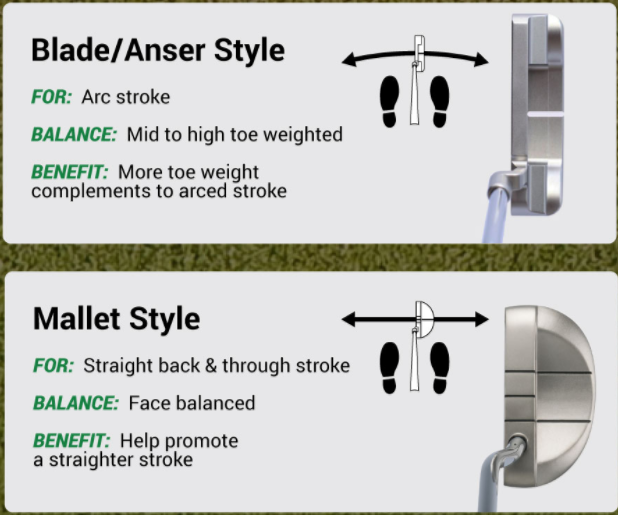 If you have an arcing stroke (from the 4 to the 8) an Anser-style putter will benefit you because they are toe and heel weighted to provide a larger sweet spot while also aiding the natural in-to-out-to-in style of this putting stroke. Once you have the right tool for the job, you can now have confidence that your putter fits you, rather than taking a random putter and hoping that it will be the right fit. And make no mistake, CONFIDENCE is the key to good putting! Often, you will hear or know of someone who has a garage full of putters and when they putt poorly, they switch their putters and putt better the next time. Believe me when I say that very rarely is the putter (club) the difference – instead, it is the BELIEF of the golfer that they will do better, and that mindset translates into confidence and better results. When they start to putt poorly again, they switch putters and the process repeats. A better scenario for long term improvement is to actually select the best putter for your stroke, then practice knowing that you and the club work in harmony. Now the success and better results are based on science, dedication and good choices, versus random chance. Now your confidence will be permanent! When you have the style of putterhead decided, the length of the putter is important to consider. Your arms should hang naturally and be relaxed, with your eyes over the ball when you address it. You will find that you most likely will need to have the putter shortened. The standard length of a putter is 35”, which is actually better suited for the average men’s PGA Tour player’s height (over 6 feet tall). I’m not sure why equipment manufacturers continue to make putters this long when a great portion of the market would benefit from a shorter length! Even taller players will still want their putter shortened to assure that their eyes are directly over the ball at address. Once you have the correct tool, and then make an effort to practice your putting, you will need to focus on grip, aim, and commitment, which we will look at in our next article. If you’re looking for someone that has first-hand knowledge of the rich and storied history of Kokanee Springs, look no further than our Course Superintendent, Colin Wastrodowski.